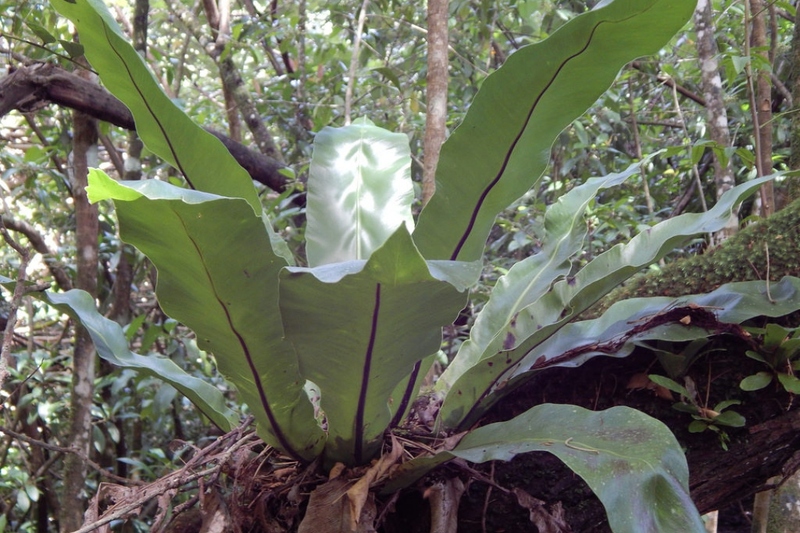 Bird's-nest fern (Asplenium nidus): growing, planting, caring. Did you know? The sprouts of A. nidus are eaten as a vegetable in Taiwan. Asplenium nidus - the bird's-nest fern - is an epiphytic species of fern in the family Aspleniaceae, native to tropical southeastern Asia, typically growing on organic matter in warm, humid areas in partial to full shade. The bird's-nest fern forms large simple fronds visually similar to banana leaves, with the fronds growing to 20–59 in (50–150 cm) long, a light green, often crinkled. The fronds roll back as they brown and create a massive leaf nest in the branches and trunks of trees. Native to the tropical regions of Asia, Australia and Africa where it grows on tree trunks or directly in crevices of the rocks, the bird's nest fern unfortunately does not tolerate temperatures below 15-16 ° C - so in most climates you will need to grow it in a pot. Good news is it grows well in the warmth of our homes, even in average light conditions. Prepare a mix of good potting soil and decomposed compost, with some sand to ensure good drainage. At the bottom of the pot, keep a draining bed with gravel. Asplenium loving humid atmospheres, it will be perfect in a bathroom. In any other room in the house, put under the pot a cup filled with clay balls soaked with water to compensate for the lack of moisture. Your bird's-nest fern is a tropical forest plant - it likes moist soils and humid air! Water every week, or as soon as you notice that the medium is dry. If it still seems very wet to the touch, wait a little, or water less each time. In the spring, every three years, depending on how fast your fern is growing. Be careful when depositing, and try not to damage the fragile roots.